Thick tufted cushions and double stacked bases. Product Description Expertly Tailored. Take a seat and enjoy the soft embrace of the Magnum sofa in brown. With leather-like upholstery that gives the luxurious look of genuine leather without the maintenance, this living room essential features traditional design elements that are both inviting and timeless. 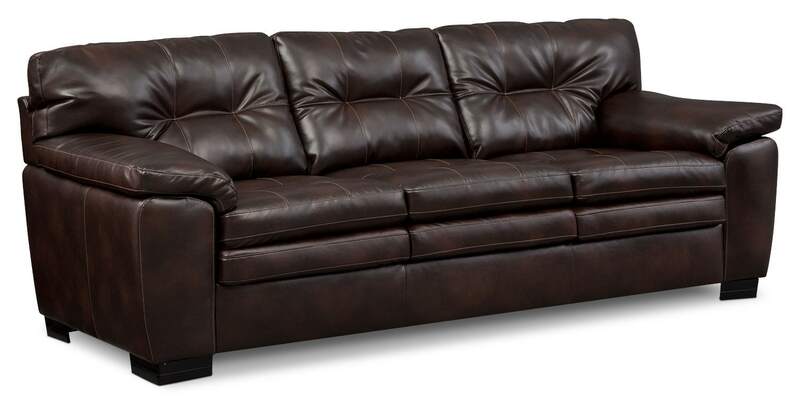 Featuring button tufting and a warm, brown color, this piece also keeps comfort a priority with its padded arms, high back and supreme cushion construction. Customer assembly required. Unique Features: Contrasting, light brown accent stitching adds to the designer details. Warm brown material easily matches any contemporary or modern décor. Furniture features traditional button tufting, padded arms and a high back for comfort.